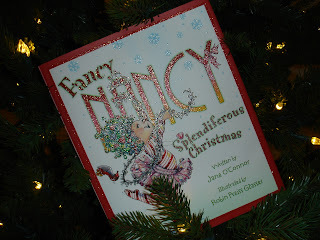 Pen Pals & Picture Books: A Fancy Frenzy!! So, Christmas decorations are always glitzy and glamorous. (Those are fancy words for shiny and pretty.) And,who else to discuss this topic than a glitz aficionado. (That's a fancy word for someone who is excited about, or knows a lot about something.) I really hope you all know where I'm going with this! If you don't, meet Nancy. She's fancy! She has big plans and thoughtful ways of achieving them. When things go awry; she is able to apologize, get help from those around her, and make the situation right. Some books try to play into the princess mentality, and then the main character comes off spoiled and bossy, which I don't want my kids imitating. However, I don't think Nancy is that way. She does want things just so, but all the books show her being able to compromise and think of other's feelings. I'd be fine if my kids copied that behavior! Once I had a tight fit I put one staple near the base and then taped down the flap on the top and cut the points off the bottle of course. 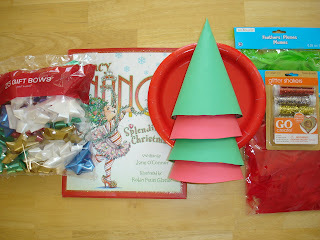 Now that we've made a few, I think you'd be safe to just use the construction paper﻿ cone and not worry about putting the party hat inside, unless you are planning on using a ton of heavy embellishments. A couple notes about the picture above: I really wanted my kids to work together on this project and sometimes when I want them to do that, I go for the old, "I'm drawing a line right here, don't cross it." 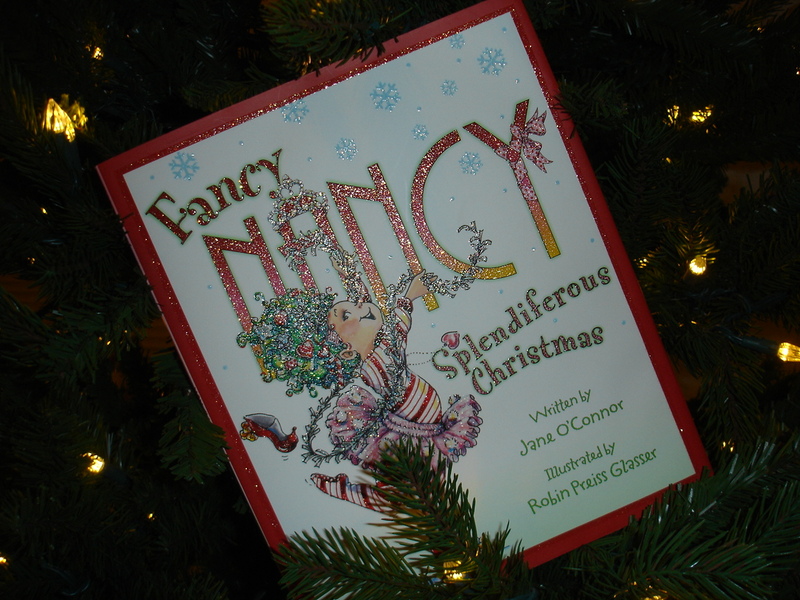 Note number two: In the book Nancy and her family use pipe cleaners, pom poms, ribbon, and stick on bows. In my mind, glitter and feathers would be fun, fancy and simple. Well, the kids revolted, so we had to try a couple with pom poms first. (Or, puff balls, you know what I mean?) Glue did not stick well to the puff balls and twisting puff balls around the pipe cleaners was a pain. 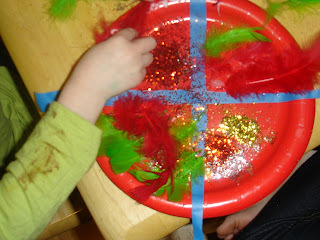 So, glitter and feathers it was! If you've got ideas of your own, go for it. You will just want to use something light that will easily be held by a little glue. See what I mean about the pattern? One child was more into feathers and the other more into glitter, so it looks planned! Anyway, the kids were in project heaven. 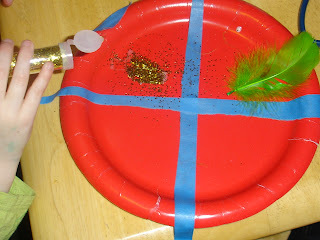 Feathers and glitter both stick to glue in a snap so they could stick and shake and glue all they wanted. 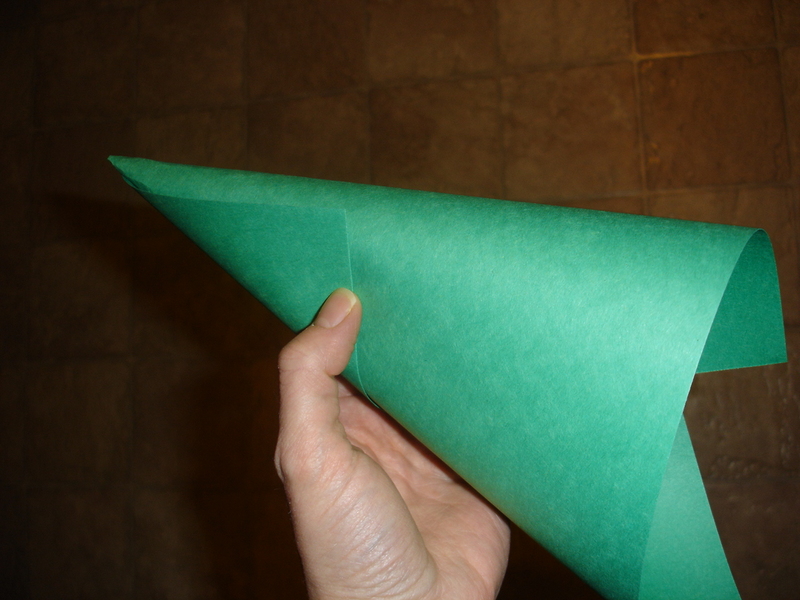 If you need tips on keeping the glue in control, see this post. After the glue dried, we removed the blue tape. It was painter's tape so it didn't damage the plate and came off super easily. Then we afixed a few stick on bows. 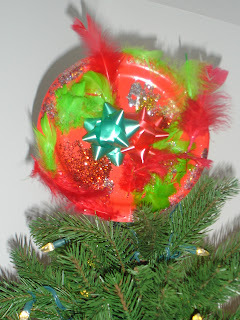 Nancy had these on her tree topper too, so we didn't go totally rogue. Plus, I think if she would have had feathers on hand she would have loved to use them as well. Finally we set it atop the tree. The kids were so excited! They want to keep it forever! 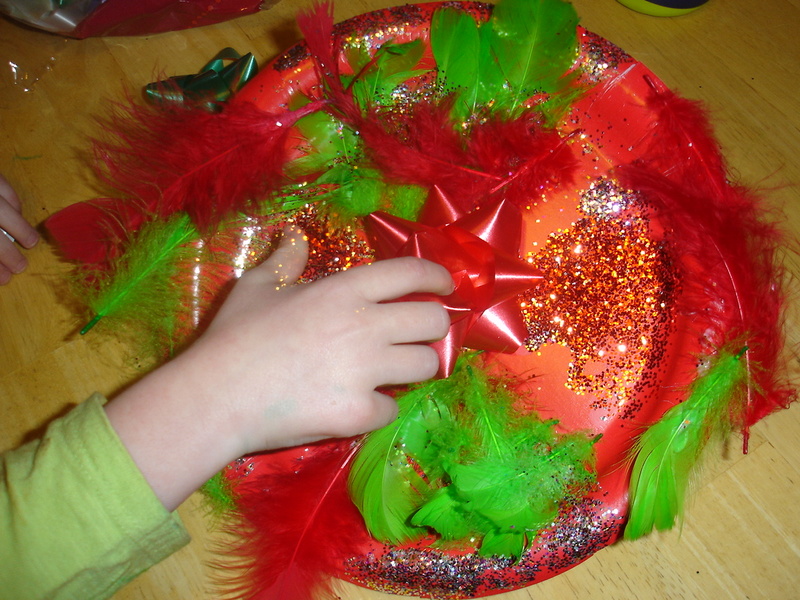 While I don't know if this topper is destined to be an heirloom like Nancy has planned for hers, I do know that glitter + feathers + bows = fanciful fun and great big smiles! Perhaps that's what spendiferous means, anybody know? Happy reading everyone and Joyeux Noel!